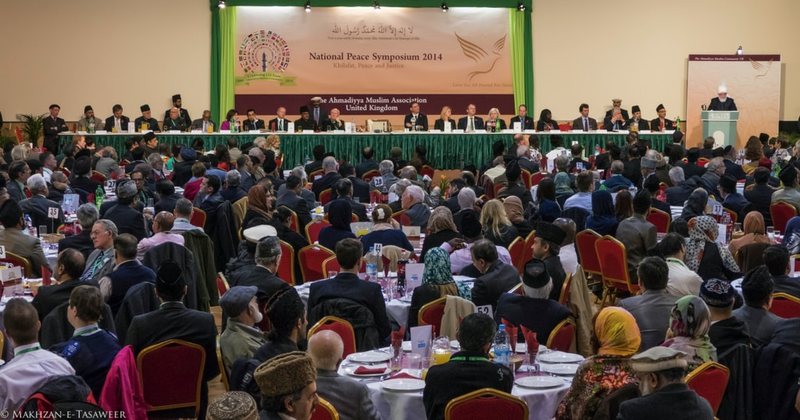 On 8 November 2014, the World Head of the Ahmadiyya Muslim Community, the Fifth Khalifa, His Holiness, Hazrat Mirza Masroor Ahmad delivered the keynote address at the 11th National Peace Symposium hosted by the Ahmadiyya Muslim Community UK. Quoting extensively from the Holy Quran, His Holiness proved Islam to be a religion of peace that promoted tolerance, mutual respect and understanding at all levels of society. His Holiness also questioned how extremist groups such as ISIS were funded and supported. The event was held at the Baitul Futuh Mosque in London with an audience of more than 1000 people, including 550 non-Ahmadi guests comprising Government Ministers, Ambassadors of State, Members of both Houses of Parliament and various other dignitaries and guests. 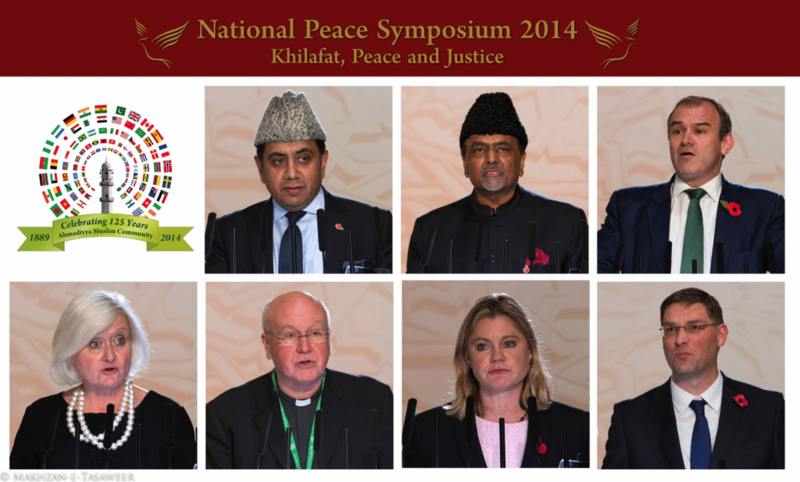 The theme of this year’s Peace Symposium was “Khilafat, Peace and Justice”. 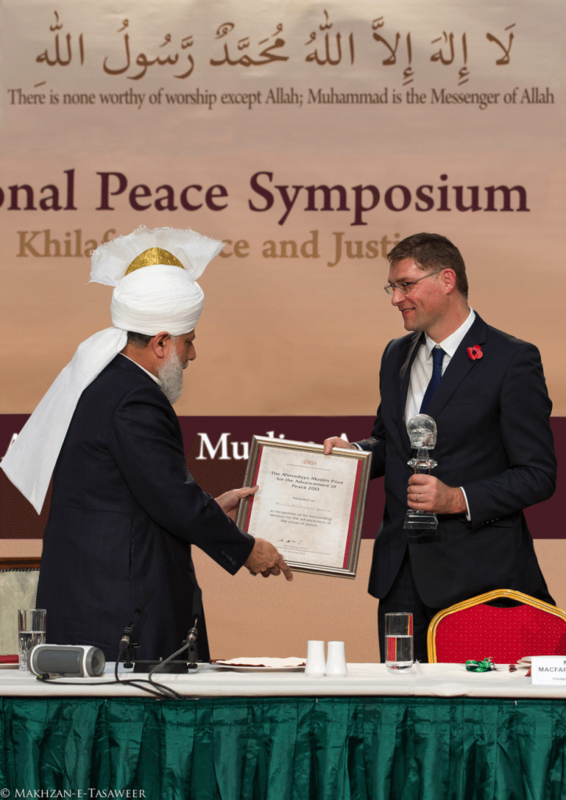 During the event, His Holiness also presented Magnus MacFarlane-Barrow, Founder and CEO Mary’s Meals UK, with the Ahmadiyya Muslim Prize for the Advancement of Peace in recognition of his outstanding efforts to provide food and education to hundreds of thousands of children in the developing world. Hazrat Mirza Masroor Ahmad began his address by speaking of the increasing threat of terrorism and extremism in today’s world. “Over the past year, one particular group has viciously spread its network of terror and has become a cause of major concern for the world. I am speaking of the group of extremists commonly known as ‘ISIS’ or ‘I.S.’ The actions of this terrorist group are not only impacting Muslim countries, but also countries in Europe and further afield are also being affected by its brutalities. 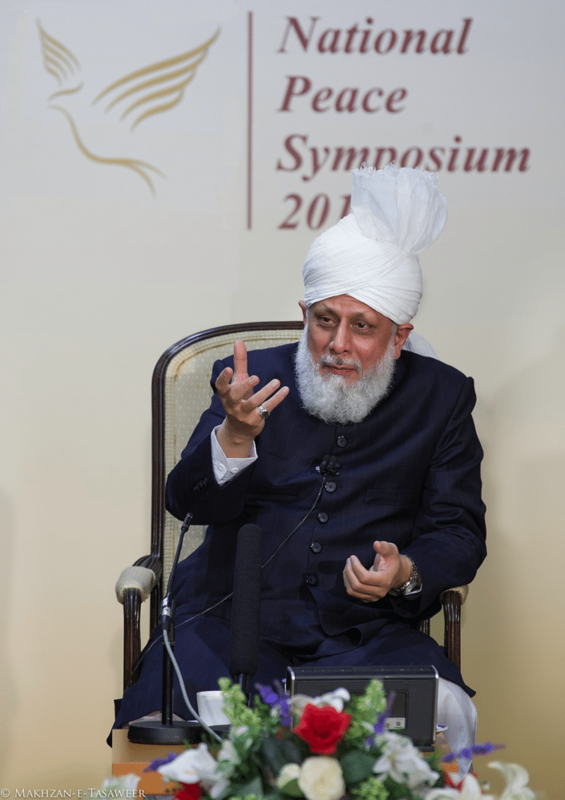 Hazrat Mirza Masroor Ahmad said it was highly “disturbing” that hundreds of Muslim youths from all parts of the world were being attracted by ISIS and were going to Syria and Iraq to fight for them. 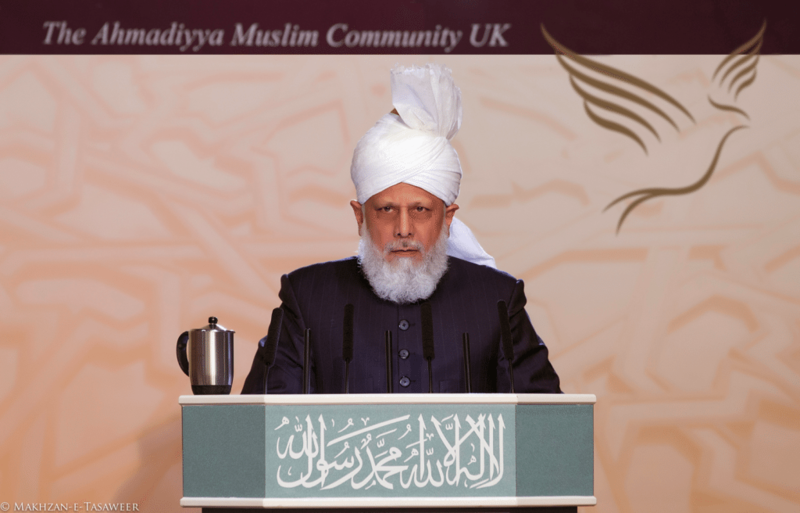 His Holiness said: “the agenda and objectives of ISIS and their so-called Khalifa are utterly horrific and barbaric”. His Holiness said that ISIS had a vision to “take over the world” which he classed as “wishful thinking”. Nonetheless, His Holiness said that if ISIS was not “stopped in its tracks” it could cause great destruction in the world. The Khalifa went on to give a detailed account of Quranic teachings in relation to warfare, stating that wherever Muslims were given permission for a ‘defensive war’ it was given as a means to protect all religions and not just Islam. He also explained the unparalleled efforts made by the Holy Prophet Muhammad (peace be upon him) to spread peace throughout the world. Hazrat Mirza Masroor Ahmad went on to speak about how ‘freedom of conscience’ was a fundamental tenet of Islam. He said that Muslims were permitted only to preach the message of Islam in a peaceful way. 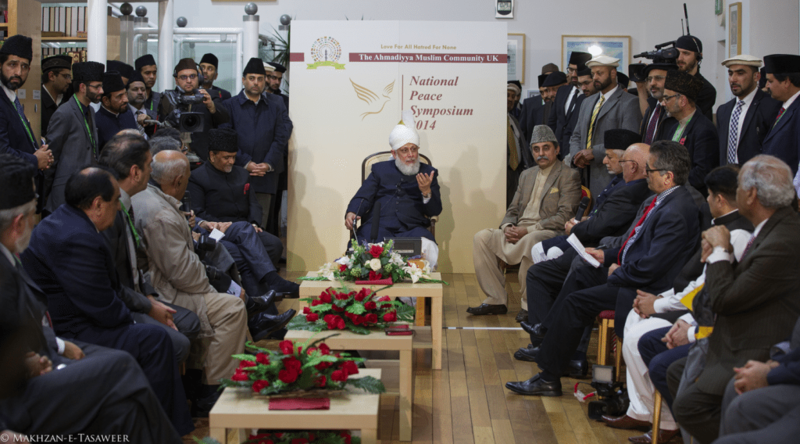 Hazrat Mirza Masroor Ahmad ended his address by questioning how terrorist or extremist groups were being funded and by appealing for world peace through true justice. “I would also hereby like to question those people or organisations who claim that Islam is a religion of violence on the basis of the atrocities of the extremist groups. I would ask them to consider how these groups are able to acquire such funds that allow them to continue their extremist activities and warfare for so long? How do they acquire such sophisticated weapons? Do they have arms industries or factories? 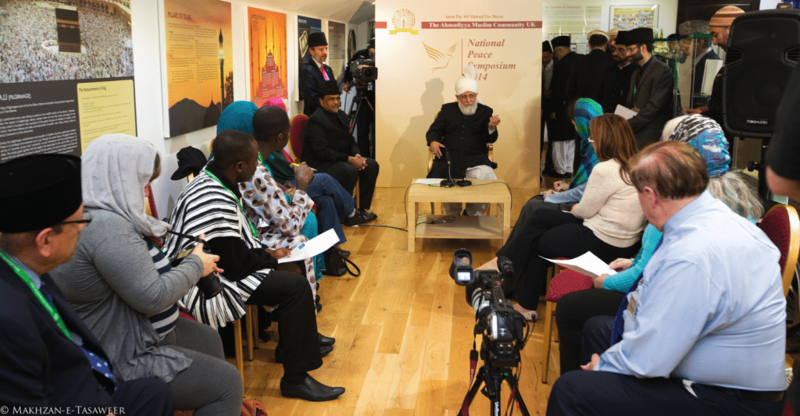 Rafiq Hayat, the National President of the Ahmadiyya Muslim Community UK, spoke of the need for peace in the world. 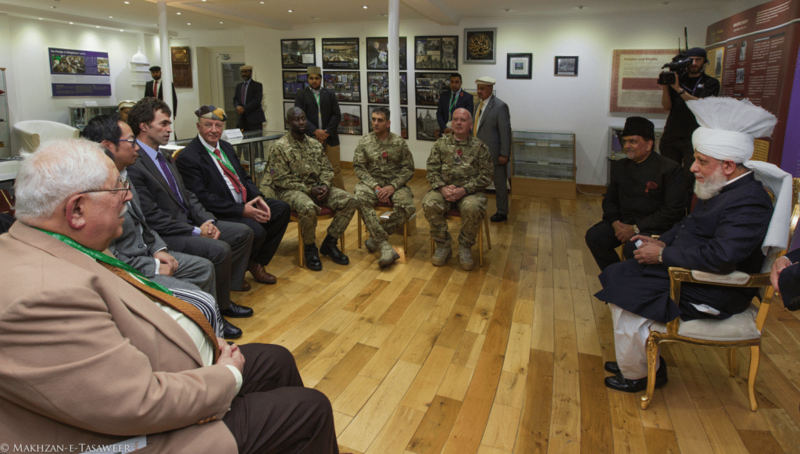 Referring to Remembrance Day commemorations that were taking place this week, he said the Ahmadiyya Muslim Community “honoured” all those British servicemen and women who had sacrificed their lives for the sake of their nation during the First World War.